I woke up to a mild morning after a restful night’s sleep. The stars were bright, the Big Dipper scoop-up near the horizon. There was barely a glow to the east when I launched into a gentle east wind. With 3-10 mph east winds predicted for the whole day I hoped to make big miles. I dug in and glided smoothly towards the Pacific. 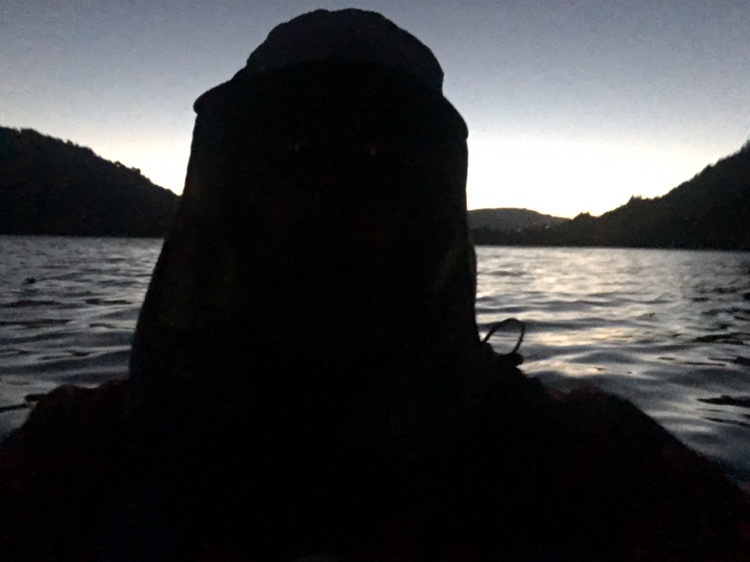 When it got light enough to see I began taking the shortest route from one forested point to the next, further increasing my effective speed. The tailwind and waves built up. When I reached one wooded point I landed the boat to look things over. It would be better to have stayed on the opposite shore had I known the wind would have come up this much. As I pondered I picked some of the plentiful blackberries. These were a different species than I’d been eating. I rechecked the wind. The latest reported wind was 3 mph. 3??? It must have been at least 15. (Later I saw NOAA was calling it 15-25.) I hated to waste a tailwind. If I could get across maybe I could still make big miles. Well I made it but I didn’t like it even a little bit. It was really tough keeping the boat straight. In those big waves it was an uncomfortable feeling. When I got to the relatively mellow waves of the other shore I was thinking about how the strong tailwinds were more unsettling than the headwinds. I think it’s because when a bow wave hits the rudder is driven deeper. When a following wave hits, lifting the stern, the rudder is lifted partially out of the water. I love this kick-up rudder for rocks and weeds, but for following waves I think a bigger rudder would be much better. Kayakers? I went around a couple more points and that was more than enough for me. I had paddled in the biggest waves of the trip. Flipping wouldn’t have killed me but it would have been mighty unpleasant. Looking at the map I found a bay where I could access a frontage road. I had to land amid big rocks which was challenging. It was wonderful to be walking my kayak down the shady, paved road, looking out at the big whitecaps out on the river, where I wasn’t. I wheeled into the campground where PCT Days is held. Looking at the campground instructions, it seemed like I should set up with the hikers and bikers. As I was setting up the campground host came up and said. This wasn’t looking good. He asked me what I was up to and then he and his wife had a conference. They were as friendly as could be. I could just put the kayak by the shed and set up my tent where it was. Problem solved. Thanks! It was fun hanging out with the thru-hikers. One directed me to the laundromat. I got a wonderful hot shower then headed over to wash my clothes amongst the thru-hikers. Neil Crawford drove over from Portland specifically to buy me dinner. We had a great talk about adventuring while we ate, with the river right out the window. I had BBQ pork and a huge piece of cheesecake. Thank you Neil! Clark: October 31st Thursday 1805 a cloudey raney morning I proceed down the river to view it more at leasure, I took Jos. Fields & Peter Crusat and proceeded on down… found the river rocky for 6 miles, after which the Current became uniform… at 5 miles I passed 4 large houses on the Stard Side a little above the last rapid and opposit a large Island which is Situated near the Lard. Side—The enhabitents of those houses had left them closely Shut up, they appeared to Contn. a great deel of property and Provisions Such as those people use, I did not disturb any thing about those houses… Two canoes loaded with fish for the Trade below Came down & unloaded the after noon fare Those Indians Cut off the hands of those they kill & proserve the fingers.